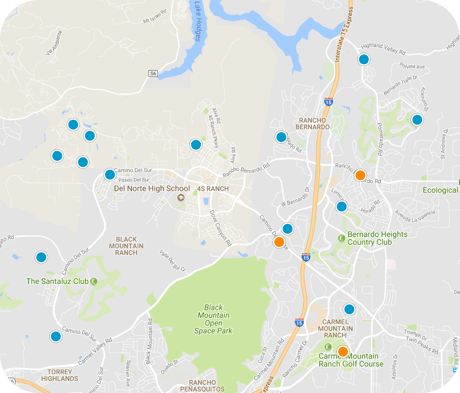 San Diego Home Sales website search offers all Rancho Bernardo homes, condos and foreclosures for sale. You are able to get new property listings daily that meet your search criteria. A community along interstate 15 lying about six miles inland from the Pacific Ocean, Rancho Bernardo, California, is a master-planned community within the city of San Diego in San Diego County. It lies about 25 miles directly north of downtown San Diego, which is easily accessed via I-15. Canyons and hills make up the area, which is bordered by 4S Ranch to the west, Carmel Mountain Ranch to the south, Poway to the southeast and Escondido to the north. The community lies on what was once the Rancho San Bernardo Mexican land grant, which was established in 1842. Rancho Bernardo has a diverse economy, with shopping malls and retails centers, office buildings and parks and golf courses. It is home to the corporate headquarters of the Japanese electronics company, Sony. Other notable companies with large-scale operations in Rancho Bernardo include Hewlett-Packard, the Eastman Kodak Company, LSI Corporation, and BAE Systems. The oldest winery still in operation in Southern California is found here as well, Bernardo Winery, which was established in 1889 and is still producing. The schools in Rancho Bernardo are under the jurisdiction of the Poway Unified School District, which encompasses 25 elementary schools, six middle schools, four high schools and a continuing education high school. The nearest hospital is just about a mile south of the community, Pomerado Hospital. Attractions in the community include the Rancho Bernardo Inn Golf Course, the Oaks North Executive Golf Course, Maderas Golf Club, Stoneridge Country Club, Bernardo Heights Country Club, Rancho Bernardo Town Center, Westwood Shopping Center and The Plaza Shopping Center. The community has its own park, Rancho Bernardo Community Park, and it hosts an annual RB Alive carnival/festival every year during the summer.